What to do about the radiator pipe? 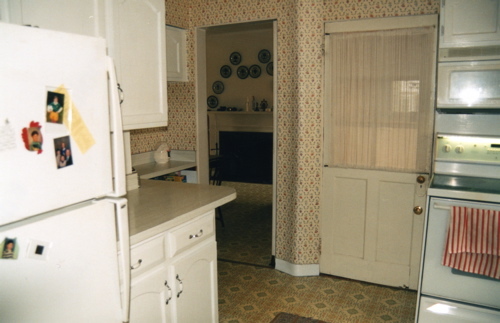 Our entire first floor had 11 foot ceilings, except for the add-on family room area in the rear, and the kitchen / butler’s pantry / powder room in the main part of the house. I knew why the family room ceiling was lower, but the 8 foot ceiling in the kitchen area made no sense. One day I couldn’t stand it any longer. I climbed the ladder with a hammer and a flashlight. Let’s just say there was no reason the ceiling needed to be so low. This action hastened the kitchen remodel, as well. A short time later I pulled the ceiling down. The original plaster ceiling was in bad shape. It was not clear if it had been covered for that reason, or if decades out of sight had caused the deterioration. The other problem, which we had anticipated, was a distinct difference between the walls below the 8 foot line and those above. The walls had been re-plastered after the ceiling was dropped, so there was a ridge where the newer plaster met the original. We solved this with beadboard and a piece of horizontal trim covering the joint at the 8 foot line. Lisa found some beautiful antique beadboard on Ebay at $5.00 per square foot, which is about the price of new oak beadboard at the big box stores. It was unpainted heart pine, about 100 years old, from a cottage in Georgia (or so we were told… you never really know). It just needed a good cleaning with furniture refinisher and a couple of coats of shellac. We covered the ceiling itself with tin, but that’s another story. A small section of wall was curved. One winter day (before the ceiling exploration) Lisa leaned up against it and found it to be quite warm – a radiator pipe! Apparently the wall was curved around the pipe after the ceiling was dropped, because there was nothing but a bare pipe sticking out above the 8 foot line. What to do? We found a piece of antique tin on Ebay just the right size to cover up the pipe. I had several pieces of oak trim left over from the Kensington Avenue remodel. A few cuts with the miter saw, a little spray paint, some stain and shellac, and presto! A decorative feature! I think I spent about 50 dollars on materials, which includes the tin piece. As all renovators know, the homeowner’s labor is free.